Using my Z77 Extreme4 board with the 2.90M UEFI, I've only installed Win 10 on an Intel 750 NVMe SSD. I was successful, and tested it with both an i7-2600K and an i5-3570K. The Intel 750 SSD is an add in card type of SSD that I had in the PCIE3 slot, so you aren't using an incorrect slot. The slot interface being PCIe 2.0 or PCIe 3.0 does not make a difference either, except PCIe 2.0 won't give you the best read speed possible, but the difference is nothing to worry about. Since NVMe support in the UEFI/BIOS is only needed for an NVMe drive to be used as the OS/boot drive, any NVMe SSD should be able to be used as the OS drive with this board and UEFI version. All versions of Windows 10 have a built in NVMe driver that is used during the installation, there is no need to install an NVMe driver during the Windows installation. After the OS installation is complete, you can install the Samsung NVMe driver. The NVMe driver is not the problem with your installation. All drivers are part of an OS installation, they are not put on or written to any other drives except the OS drive itself. When you installed the NVMe driver while running your other OS, the driver was only written to the other OS drive. Sorry but that did not help at all. "GPT Partition scheme for UEFI" for the Partition scheme and target system type. Be sure to set File System to FAT32. The File System entry is for the USB flash drive, NOT for the OS drive. It is a very common mistake to set it to NTFS, and may be the main cause of your problem. You chose the "partition scheme" for the OS drive above, which is GPT. As you have been doing, be sure to select the "UEFI:" entry for the USB flash drive in the boot order when you start the installation. 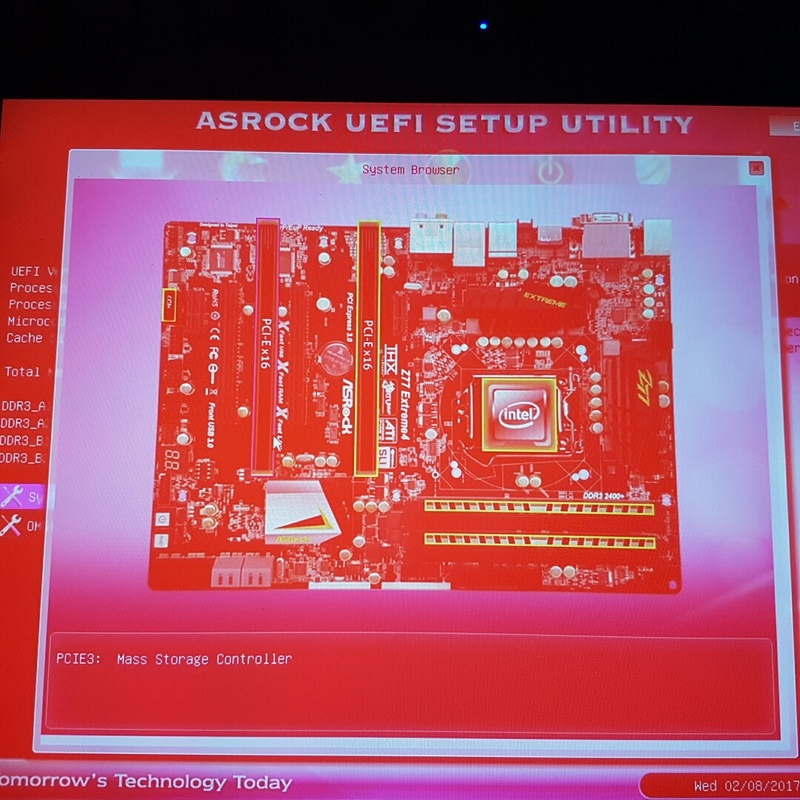 One more thing you have not done that will insure UEFI booting. In the UEFI/BIOS, find an option called CSM, it's either in the Boot screen, or ACPI Configuration screen. It will be set to enabled, click it to open its sub-options. Find the Launch Storage OpROM Policy option, and set it to UEFI Only. You'll need to Save and Exit the UEFI/BIOS before it is applied, then go right back into the UEFI and check/set the Boot order for the UEFI:<flash drive name> entry. You should be using a USB port on the IO panel. That's it, but you should choose a Custom installation in the Win 10 installer, so you can delete any existing partitions on the 960. It should be recognized by the Win 10 installer. Once it is all unallocated space, click on New, which will format the 960. You'll get a prompt about creating partitions, just click Ok. You should get three partitions created. Then just click next and let the install happen. Do NOT remove the USB flash drive until Win 10 finally boots to the desktop for the first time. NOTE: Sorry about some of the screenshots these were taken on my Cintiq Monitor, which connects to my graphics card (and the first port is the only one that will fit this) with a DVI-I connection (which is hardwired into the LCD Tablet) and for some reason displays red. Not sure if this is a connection or BIOS thing as I am pretty sure when I originally setup my PC it was black. This does not affect the monitor when windows is running. Ok, So after several attempts to install Windows on my SSD again last night and reading your post several times I seem to be further back that I previously was, as now I cannot get Windows to create a Boot Manager record in the BIOS. It just keeps booting back into the USB and attempt to start the install process all over again. First I will address some of the things I tried including a tip in your post I thought may work, but alas it did not. :( I will then add below some screeenshots of my bios and the install process so that it can more easily illustrate the settings I have and you may see something I have overlooked. I noticed in your post that you mention the USB should be in the IO panel, I was not doing this I had it plugged into the front on my PC. So I plugged it into one of the USB 2.0 ports in the back, unfortunately this did not change anything. The other thing I tried was manually clicking on the NEW button when setting up the SSD to install windows. I normally just clicked NEXT on the Unallocated Drive and let windows take care of this. Either way windows seems to create the exact same number of Partitions as shown below. Figure 1. 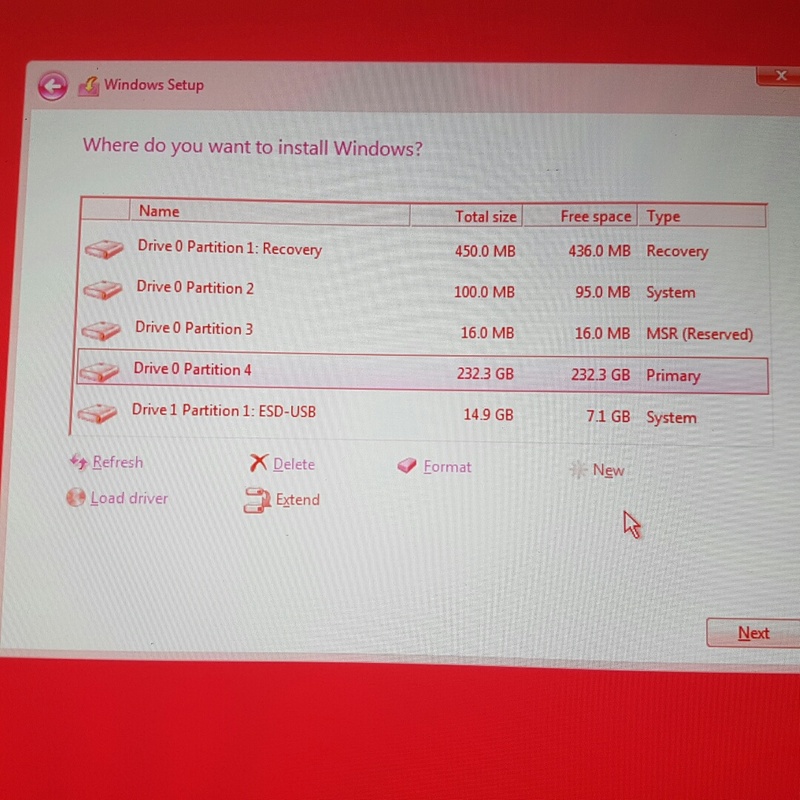 Whether I manually click NEW to setup partitions or just Click NEXT windows creates the same partition setup. 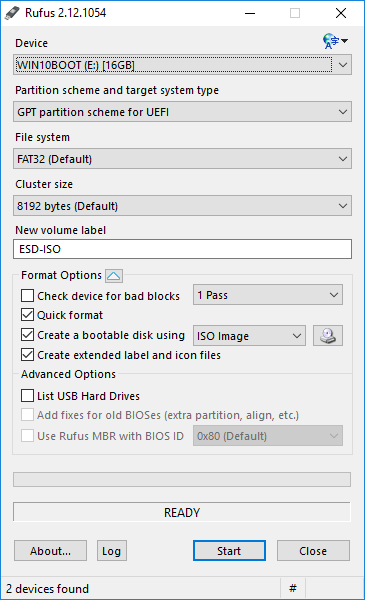 I created a NEW Rufus UEFI Boot USB (The NTFS format was a default Rufus changed when I added the ISO, I fixed this and there was no change), once after manually formatting the usb as FAT32 and a second time via Rusfus again ensuring the format is FAT32 with GPT UEFI setup as per screenshot. Figure 2. 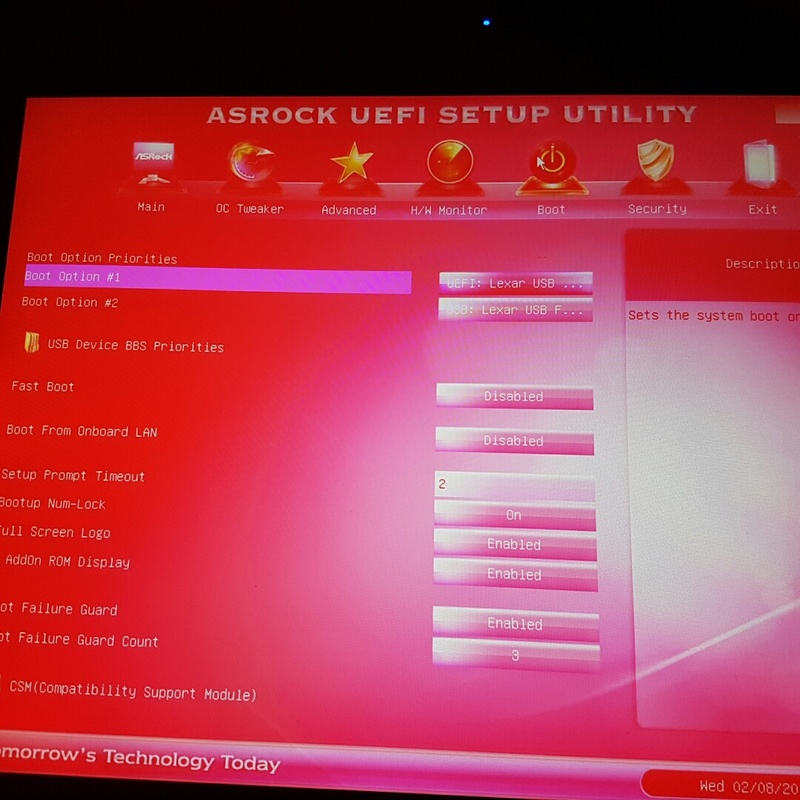 Rufus UEFI Boot USB setup. NOTE: I do leave the USB drive in the entire time, but as I said it seems to just keep loading the start of the Windows Install again not actually the continuation of the Windows installation process. To eliminate anything I can think of I removed my graphics card, so the only Inputs to the PC were my second monitor running via DVI-D into the motherboard, Ethernet cable, Keyboard and Mouse connected in the top two USB connections and the USB Boot drive in one of my Grey USB 2.0 ports and of course the PCIE Adaptor and Samsung 960 EVO M.2 SSD. 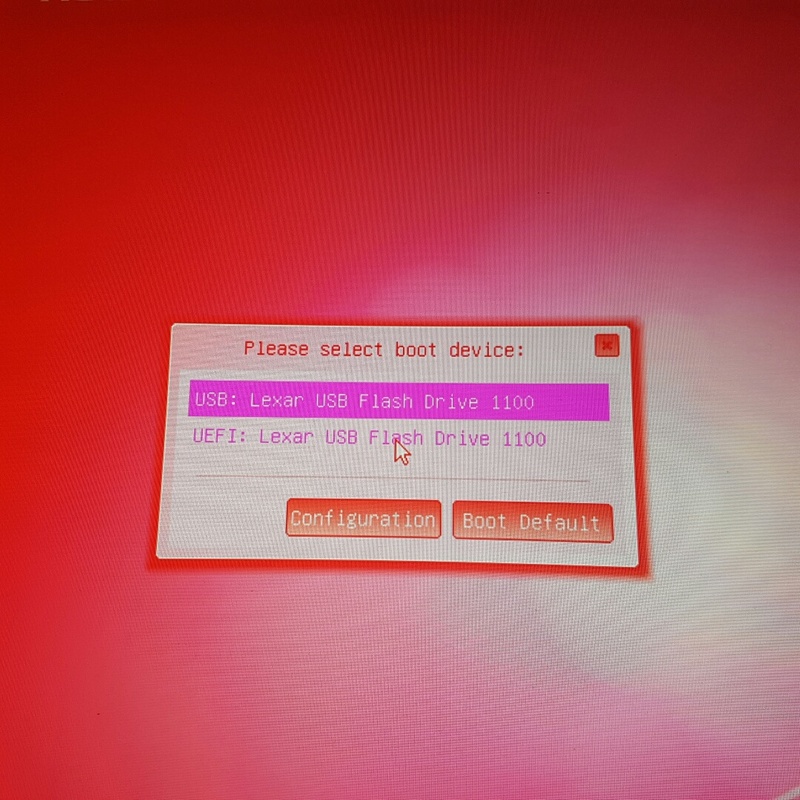 I did noticed something interesting, but it might be nothing... when in the BIOS the first boot drive is UEFI: USB X, however if I press F11 for boot options when booting UEFI: USB X is the second option and USB: USB X is the first. Is there a way to tell when you have booted into the windows installer maybe via command prompt where it has successfully booted in UEFI Mode? I am wondering if it is doing this correctly, even though the windows installer seems to create the correct partitions for install. Figure 3. 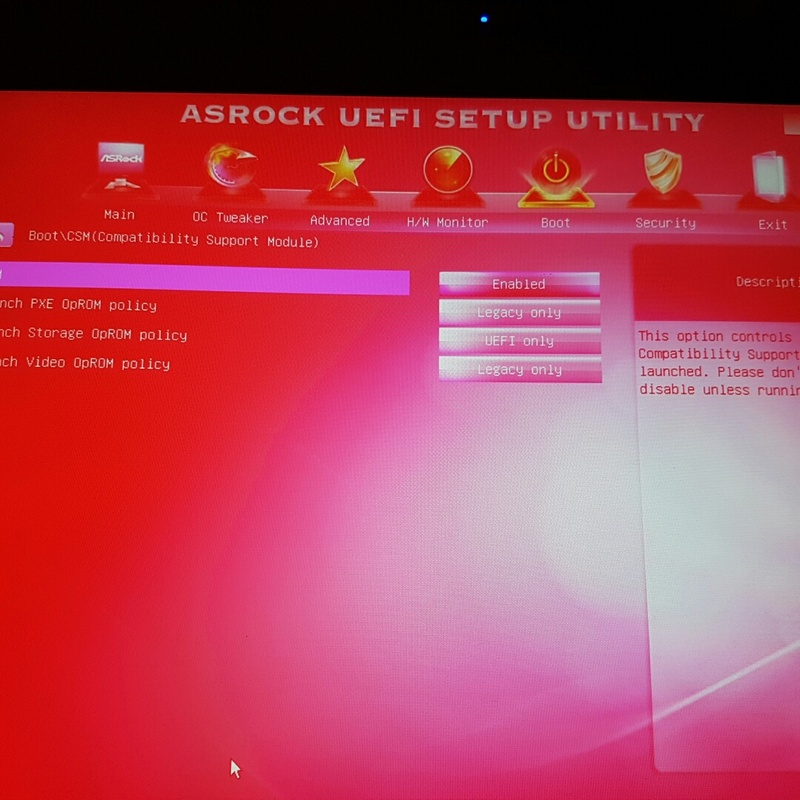 When F11 Boot Options selected it shows USB selection first even though BIOS has UEFI. Not sure if is an issue. I will attach a copy of my BIOS screens for you to confirm my settings. These are the same settings I have had the entire time, with the exception of trying it with CMS disabled which would not boot at all as my graphics card is not a GOP card. Figure 4. System Browser shows my adaptor and Samsung 960 EVO M.2 SSD registered as Mass Storage Controller. Figure 5. Shows the Storage Configuration settings. I have no other drives connected. Figure 7. 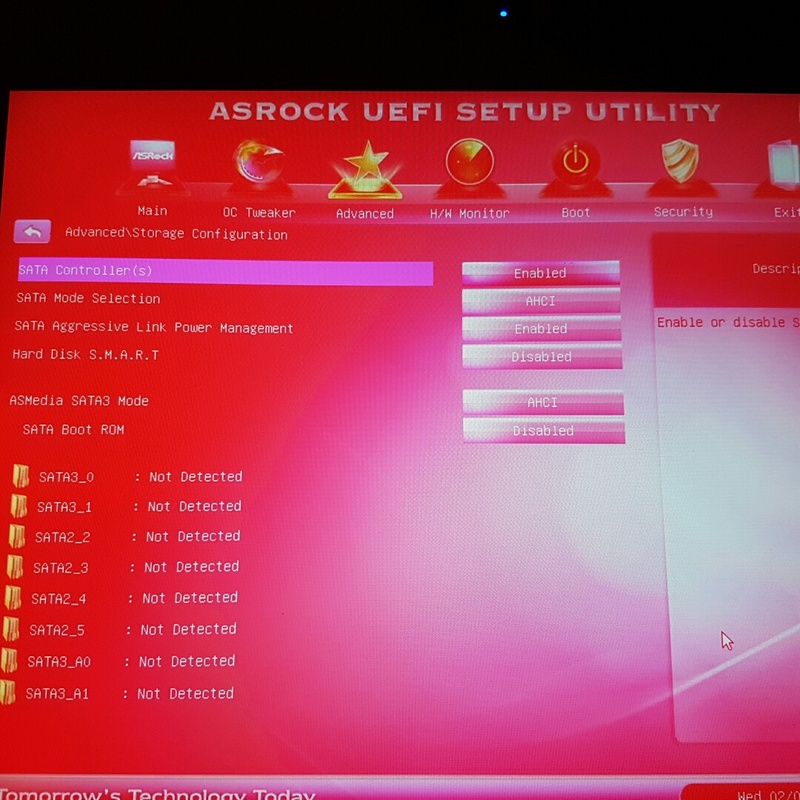 Shows my first Boot Option is set to UEFI. I wish there was something obvious I was missing, my components are perfectly fine and would like to push any MB/CPU upgrade off until next year when the next generation of boards and CPUs come out it I can. So any further insight is much appreciated. I may also trying Installing of my Windows 7 disc and then upgrade on top of that to get to Windows 10, it thats a viable, albeit long winded and non-clean way to go about it. 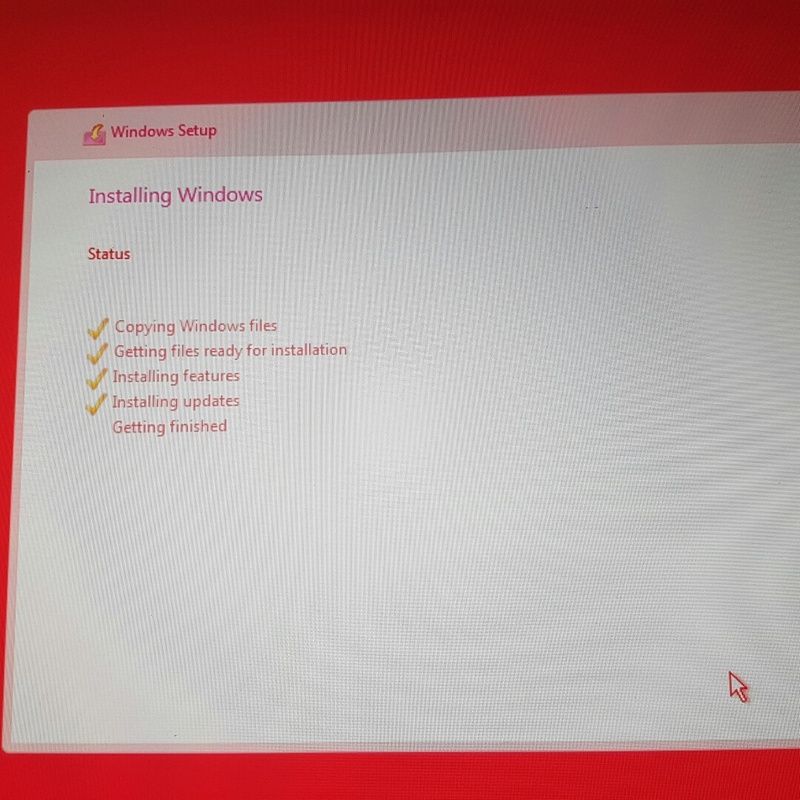 I may also try may a fresh Windows 10 Install on my old SSD and then maybe a clone to the M.2 SSD as I have read some people are doing this as opposed to a clean install directly on the M.2 SSDs. Has anyone had any success with this? I guess I will try anything before I HAVE to throw down $6-700 on a new board and CPU. I tried to Install Windows 7 from my DVD and load the "Samsung NVMe drivers v1.4.7.17 WHQL for Win7" 64-bit drivers and even the 32-bit drivers with no luck so Windows would not recognise my SSD. I also tried the Samsung data migration tool and cloned my current SSD to the M.2 SSD which cloned fine, but I could not boot off the m.2 SSD, even after trying to /rebuildbcd. which mentions a P2.90Q bios update which logically seems to be a later version than the P2.90M currently installed and seems to have worked for someone else running a Samsung 960 PRO so sounds promising. As I seem to have tried just about everything else I don't have much to lose as at the moment my only other alternative is to get a new board and cpu. I will try the update tonight when I get home from work and update if it solves my problem. You can try that other BIOS version, I've heard of something similar, but that version was not distributed normally for some reason. One thing I've never seen is the Windows USB installation drive shown as an installation target for Windows!! That is... crazy, I don't have words for it. That should NOT be there. Oh Rufus, I know why I never use you. Otherwise, the list of partitions for the OS drive you have in your picture is correct. Why it keeps booting the installation drive is crazy, that never happens to me. How do you tell if you booted the USB installation drive as UEFI:? Select it in the Boot order, and Save and Exit the BIOS! I don't use F11 to select it. Start a command prompt (Admin) and type in diskpart. They type list disk, to find the USB flash drive. Note it has a number next to it. Be CERTAIN you are selecting the USB flash drive, because in the procedure that follows, you are wiping it clean and staring over. Substitute the number for n in the list of commands. Press return after each line. The flash drive has no name at that point, you can change it with its Properties tab. Go to the ISO file, left click on it and choose Mount. Then all the ISO files will be listed. Then either highlight them and Select All, or left click among the list and left click and Select All. In the highlighted area left click again and choose Send To, which will then list the USB flash drive. Select it and let the files transfer over, it takes a while. You cannot just do a drag and drop of the files, you must do the Mount and Send To procedure. I have five different models of NVMe SSDs, and this is how I always create the bootable USB installation drive. sorry to hear you weren't feeling well. There was no rush, to get back to me. I was mainly just updating the post as I tried various workarounds without much success. So I then decided to proceed with upgrading the Bios to P2.90Q, so I added it to a clean usb key jumped into the BIOS and used the Instant Flash to upgrade. 2 mins later my PC rebooted twice, next thing I notice... BAM! It's booted into the last Windows attempt I tried to install on the SSD. I ran some software updates for Windows there were quite a few let it reboot a few times in the process, before then installing a couple of my main programs and then switching it off to plug back in a few of my other drives. But it works great. Now I am happy with the current speeds I am getting, I didn't expect to get top claimed speeds, but I did notice one thing, the drive seems to only hit about 1400mb/s read where as when I was on my other SSD in windows and testing the 960 EVO it was getting over 2000mb/s, now this might just be because I am now running the software and windows on the 960 EVO, but I thought this was quiet a difference. I was ran both tests with the same 2.1 Samsung NVMe Driver loaded as well. I can't remember the IOPS scores of the top of my head but they were still pretty impressive. So to summerise it looks like it you want to install a Samsung 960 EVO NVMe SSD on the Z77 Extreme you need to install the P2.90Q BIOS. I am not exactly sure what's in the update but it worked a treat. I have been working all evening on this and I can't seem to boot on my SSD. First I installed the asrock Beta BIOS for the Asrock Z77 Extreme 4(which is the motherboard I am using). I cloned the install of my current Sata SSD and transferred over the new one(I have the NVME driver on my current OS), no luck there. So I installed zorin OS 12 because I want to dual boot between linux and windows 10. Then I tried a clean install of windows 10 following your guide and I was still unable to boot on my PCI-E SSD. I don't see the NVME SSD in the boot manager at all. Posting here first in case there is a quick fix for this. I have an ASRock Z97 Extreme4, BIOS v2.5. I have been running a 512 GB SATA3 Samsung SSD. I just cloned from it to a new SM951 256GB AHCI in the M.2 slot with drive letter assignment set to auto. I have the BIOS set to force M.2, and under CSM, Launch Storage OpROM Policy set to UEFI only. After it was done cloning, I shut down, removed the cable to the SSD and tried to boot from the M.2 drive. The BIOS still sees it, and I can choose it, but it stops at a blank screen, no windows (10). I can still plug in the SSD and boot from it. The M.2 drive is listed as drive I:. Is this my issue? How can I change the M.2 to C:? Is there anything else to check? My next question will be has anyone successfully used a PCIe 3.0 x4 adapter card in this MB to get the full speed out of the SM951 as a boot drive? Now to read the other 18 pages of this thread!